To restore and enhance biodiversity in agricultural landscapes, it is essential to increase the quality and amount of farm’s edge habitats while optimizing the farm yield and profitability. This land usually is less fertile and marginal and given over to uncropped areas such as field margins, field corners, and buffer zones. Protecting and restoring these uncropped areas along with sustainable intensive agriculture on cropped areas will provide multiple benefits, such as improved farm productivity, increased number of pollinator insects, and other faunas such as earthworms to maintain soil fertility, reduced chemical and nutrient leaching into local surface water bodies, enhanced carbon sequestration, and landscapes supporting a diversity of ecosystem services for the whole of society. Simultaneously, achieving higher yields on farm will reduce the need for agriculture expansion into the remaining natural habitats that are vital for biodiversity and other ecosystem services. Achieving more crops per acre of land, per drop of water, and per measure of other farm inputs will resist pressures on land occupancy and therefore provide more space for biodiversity and ecosystem conservation. Research shows that the highest potential to create positive impacts on biodiversity can be expected from the greening element “ecological focus areas” (EFAs). 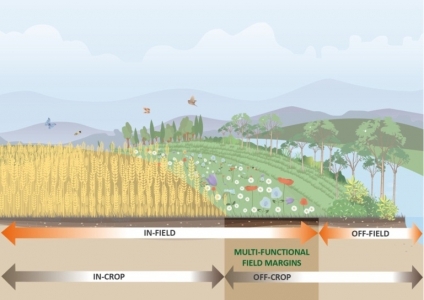 EFAs are a mean to create bounding systems in the agricultural landscapes, which should guarantee the networking of biotypes and habitat as well as improved protection of soil, water, and climate. To make EFAs truly effective, agriculture needs to move from single-function to multi-functional benefits of agro-environmental measures. This is possible through the proactive and integrated management of multifunctional field margins (MFFM), which can create a number of benefits for biodiversity conservation, and managing soil and water resources. The concept of MFFM aims to identify and solve multifunctional issues to improve resource efficiency in a practical manner, integrating result-oriented seed mixtures, management practices, and land use planning on a farm scale. Through a simple assessment of the landscape, soil type, geography and climate, it is possible to fit existing farm management options, as well as subsidy and achieve multiple benefits from the implementation of this unitary approach whilst maintaining a sustainable and productive farming business.